Consider this post the soulmate of the green superfood powder buying guide that was originally published in 2012. With the release of Incredible Berries, it’s high time the internets had a useful guide written about red superfood drink mixes to help people navigate the waters with these types of products. There are less red superfood products than green, probably because there’s less mood affiliation with health for red foods and it’s more difficult to keep the product cost down. Berry powders are consistently more expensive than green food powders, and there are less ingredients you can include in the mixture to keep price down. The combination of a less developed market and lower margins probably makes companies squeamish about jumping into the fray. But that said, there are a lot of wonderful things about berries powders, many of which you can’t get with greens. I don’t get paid by any of these companies. I make a product of my own, but I specifically write to avoid any potential conflicts of interest, not create them. All viewpoints in this article are my own opinion, and yours might vary. I write to inform, not spin. Thanks! Better taste. Berries are naturally sweet, so it’s much easier to create a formulation that’s appealing than with a greens powder. This is especially useful for people looking to use a superfood powder with their family who might not be as tuned into healthy living as you are. Higher ORAC/Antioxidant Value. Most berries are naturally high in proanthocyanidins, resveratrol, and anthocyanins in greater quantities than green foods. The presence of these nutrients is due to the colors of the foods themselves, since they’re also what pigments the foods. In my opinion these compounds ought to be given the same status as vitamins since it seems abundantly clear that they’re vital for maintaining good health. Consistently High Quality Mixtures. 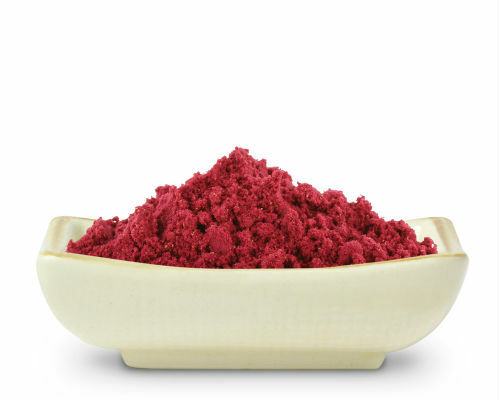 As a whole the ingredients in red superfood powders are more consistent in their nutritional quality and taste, so there’s much less incentive to cheapen the mixture. The spectrum of berries powders is consistently higher than green food powders for this reason. Rainbow Powders. These are mixtures that contain green, red, and possibly orange/yellow/purple foods, and are typically about 30% red foods by weight. Rainbow Vibrance by Vibrant Health is an example of this type of product. Greens powders with berries added into them. These are the most common. They usually consist of a greens powder with a portion of the mixture switched out for some berries. They resemble greens powders more than pure Red food powders IMO. Popular examples are Amazing Grass Berry Green and GreensPlus Berry Burst. Pure red superfood powders. These consist largely of red foods/fruits as their base with other ingredients added in to compliment the nutrients of the berries. Examples are Incredible Berries, Miracle Reds, and Fruits of the Earth. Since I already take a greens powder regularly, the latter category is my personal favorite. They’re more unique. However, there’s no “best” type of product, it just depends on your preferences. All of the products I cited above are very good and would get my “thumbs up” if you wanted to try them. Acerola cherry – Similar to acai, but more nutritionally potent. It’s a more powerful antioxidant and is >3.5% vitamin C by weight. The best of the Amazonian berries IMO. Bilberry and Blueberry. Good sources of lutein, very gentle effect on your blood sugar, and have very positive effects on cardiovascular health if eaten regularly. Schizandra berry – For a berry, it’s a remarkably powerful adaptogen and that’s used to alleviate stress and improve mental and sexual performance. (Don’t get carried away with the last part though). It’s a central tenet of east Asian herbology. Goji – Really a wonderful and nutritionally complete food that contains almost two dozen different minerals and a unique mix of phytochemicals like zeaxanthin and lutein that’s very well absorbed. Pomegranate – Powerful antioxidant that seems to exert positive benefits on a wide variety of diseases, albeit with limited research thus far. Berries powders can be used in the same ways as greens powders, so I’d recommend looking over the green superfood powder buying guide if you want some basic guidance. However, there’s one remarkable benefit that’s unique to a red food powder: you can use it as a sweetener and sugar substitute. Yogurt, juices, desserts, and even some baking dishes are all very complimentary to a reds powder, and for people with blood sugar problems they can be an effective way to have something sweet and simultaneously reduce the sugar in their diet. Okay Jonathan, if it was your money…..which one would YOU buy? Best greens powder with berries: I like Amazing Grass Berry Green personally. It’s a very good mixture all by itself, and its mix of berries trumps other products in this category. And Amazing Grass is always a good bet for solid value. Best tasting: Incredible Berries and Miracle Reds. Both do a great job of capturing the benefits of the sweet berry taste, and both have the benefit of being well rounded, robust mixtures that’d also satisfy people who are picky about the ingredient list. Most well-rounded: Fruits of the Earth. This is because it’s primarily a berry/fruits powder, but includes a nice assortment of grasses and has a nice list of probiotics. Healthforce products are always very unique. Most nutritious: You might think this is a cop out, but…….I honestly don’t think there’s a clear winner here. They’re all very good. I know, I know, this isn’t what some of you will be looking for, but it’s the honest truth. When I look at the labels of the different products there are different assortments of +’s and -‘s, but there’s nothing that’s head and shoulders above the rest. Like I said, all berries and red foods are likely to have an assortment of nutrients which overlap quite a bit due to their color. There hasn’t been a flood of new entrants into this niche like greens powders, and the ones that are there are well established companies that have good reputations for quality. (AFAIK the only exception would be me. I’m not nearly as big or widespread as the other companies listed here, so I can’t group myself with them yet, even if I’d like to. There might be other small supplement companies that make a berries powder but if they exist they don’t do a very good job of promoting themselves since I haven’t found out about them after 30+ hours of research). Compiled on 09/22/2013. If you notice any discrepancies then please let me know. I always like how honest you are about other companys products. Ive tried amazing grass and thought it was very good but i’d like to try incredible berries too. Thanks Shana. I like amazing grass products too. If you have any questions about Incredible Berries just let me know. Hi Jonathan, I’ve really enjoyed your articles about different superfood powders in the past and really liked this one too. I decided to go ahead and try Vitamineral Green based on your article and have really enjoyed it so far. Incredible Berries looks interesting. I was also wondering if you’ve ever tried Perfect Food by Garden of Life? They have a berry version of this product that has some fruits added to it. I’ve never tried it myself, but going off the label it looks pretty good. Garden of Life in general makes good products so I’d guess that it’s fine. I might even include in future revisions of this article. I have tried the ones you mentioned, and I have to say Incredible Greens is by far the one my body ingests the best. I don’t have any issues with it, and I am just so excited to try the new Incredible Berries, on their way now! One question, would taking the IBerries in the morning, and the IGreens in the afternoon be too much? Would you alternate greens and berries on a daily basis? Hey Tanya, glad you like IG so much! Your order is likely somewhere on the Canadian border right now. As for using them together, taking one in the morning and the other in the afternoon……there’s no problem with that. The ingredient list actually overlaps very little……they only have 3 ingredients in common (milk thistle, lecithin, acerola cherry), so you wouldn’t have to worry very much about “overdosing” on something. If you’re going to take both on a daily basis I would take one serving of the greens and one serving of the berries each…….one in the morning and one in the afternoon/evening. If you’re going to take one serving a day then I’d alternate them day by day. Never heard of Global Blend. Is it sold through an MLM company? Haven’t actually tried Juice Plus yet. I’m always looking for more products to review so I can put it on my list. Have you heard of Ruby Reds by New Vitality. Is should come up on a web search every time. Any opinion on the Trader Joe’s Super Red Drink Powder Dietary Supplement? Are you still out there JB? Yes, although I admit I have not been as publicly visible as I used to be. Looking to change this for 2017…….I’ve needed to do a lot of behind the scenes re-arranging that’s taken a lot of time to sort out and it’s taken away from the time I have to spend on public facing endeavors. Question. Why are grasses so good?. Isnt it true that we dont digest grasses, thus, only urinating them out. Cows digest grass, but they need 4 stomachs to do so. Dogs eat grass, but only if they want to vomit. Sounds like its a fad, and they cost alot. Hi Jonathan, do you have any review of “Go Ruby Red” fruit powder drink by Institute for Vibrant Living (IVL)? Is there a reason you left out Vital Reds from the list? RED FOODS seem to be the new wave. But little good comparative data is available on the products. Even yours above is too general. Which are scams and which are legit? How and what is being used in their processing is important in final nutritional value. If the science is good on red foods (is it? ), then companies making it need to be assessed for quality and toxins. For example, wondering how your suggestions compare to others like “Super Reds” and Kara” Revive Reds” and Gundry “Vital Reds”? Gundry is most promoted, most researched (right? ), and most expensive (way high!) but doesn’t mean works or that its still potentially a rich mans scam. How do we know what we are putting into our bodies?